How does Apple's latest iPad compare to the last one? It's thinner, but is it better? Apple's been busy lately. Just weeks after unveiling the iPhone 6 and iPhone 6 Plus, it's unveiled brand new iPads in the form of the iPad Air 2 and the iPad Mini 3. The success of the iPad Air 2 is a given - Apple could stick its logo on a donkey and millions of people would buy it. But with the competition catching up fast and phablets offering big-screened fun without the need for equally big pockets the tablet market is more competitive than ever. Is Apple still pushing tablet tech forwards, or is the iPad Air 2 a collection of minor improvements? Let's find out. You'll be shocked to discover that the iPad Air 2 looks awfully like the iPad Air. There's a new colour option (the same champagne gold that the iPhone comes in) and it's 18% thinner at just 6.1mm thick, but you're not going to mistake it for any other device. One important detail is new, though, and that's the Touch ID sensor that also acts as the home button. More about that in a moment. 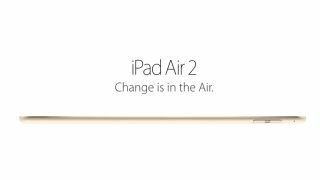 The most important change in the iPad Air 2 is the way the screen is made. By eradicating the air gaps between different layers Apple has managed to make the display significantly thinner, and it has the pleasant side-effect of making the pixels appear closer to the surface of the screen too. The much rumoured iPad Pro didn't make an appearance this time, so the iPad Air 2 remains the biggest tablet Apple currently sells. It's also the slimmest, with a case that's just 6.1mm thick. The 9.7-inch Retina display of the original iPad Air was pretty tasty, but rivals manage to stuff even more pixels into their tablets and on paper at least the Air's 264 pixels per inch looks quite small. However, rather than join in the pixel density race, Apple has kept the Air 2 display as-is: once again it's 2,048 x 1,536, but it's better integrated into the panel (like the iPhone 6) which means the iPad Air 2 can be slimmer. The iPad Air 2 screen is anti-reflective, too, which should make it more usable in brightly lit areas. Was keeping the screen the same resolution a mistake? We're not entirely convinced of the merits of ever-higher pixel density for tablets, which we don't tend to use at less than arm's length. To our eyes at least the Retina display is perfectly sharp. The iPad has two cameras, a front-facing Facetime HD camera and a rear-facing iSight camera. On the original Air they were 1.2MP and 5MP respectively, with video recording of up to 1080p HD with stabilisation. The iSight camera offered a very respectable f/2.4 aperture for low light shooting. In the iPad Air 2 both cameras have been improved. The Facetime HD camera has been upped to 1.5MP, and the iSight camera is now an 8MP model with an f/2.4 aperture - close to, but not quite as good as, the f/2.2 in the iPhone 6. The sensor is new, too, offering better low light performance and better image quality overall. It's a shame that the iPad Air 2 didn't get the optical image stabilisation of the iPhone 6 Plus, as we've found that the bigger and heavier the device, the more photos suffer from shaky hands syndrome. The A8X processor includes an Apple-designed image signal processor to reduce noise and artefacts, and the iPad Air 2 can now record panoramas of up to 43 megapixels. It gets burst mode too for high speed action, and the iPhone's timelapse and slo-mo features make it to the tablet too. The iPad Air's battery is a whopping 8,826 mAh, although that was slightly smaller than the 11,560 mAh in the iPad 2. Apple managed to reduce the bulk without damaging the headline 10-hour battery life the iPad always promises, and the Air delivered up to 10 hours on Wi-Fi, watching video or listening to music on the Wi-Fi only model and 9 hours on the cellular model.